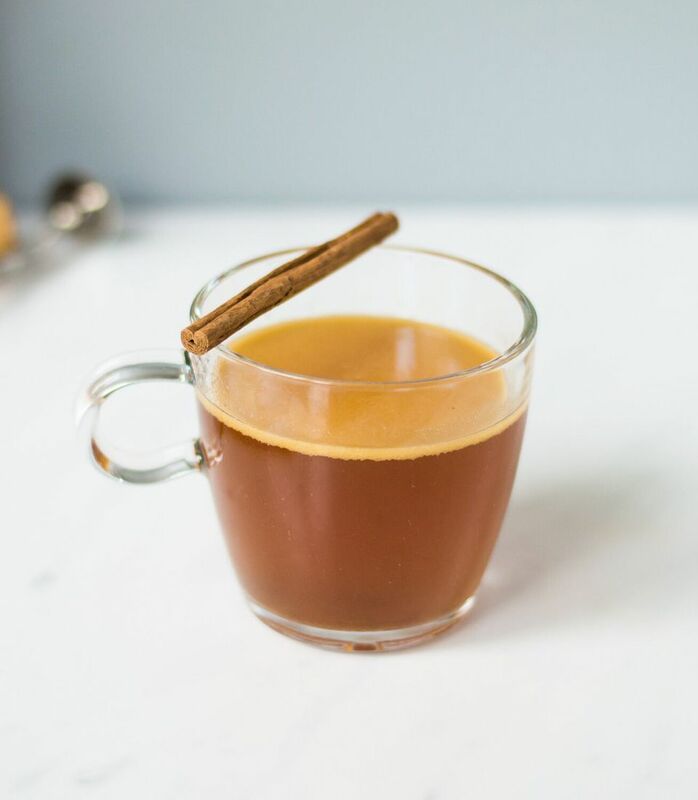 Hot Buttered Rum is a favorite winter drink because it is both sweet and warm, which is just the kind of comfort we want on the coldest days of the year. There are a number of ways to make this popular drink and two are included here for you to choose from. The first recipe is very simple and can be used to quickly mix up one or two Hot Buttered Rums at a moment's notice. The second recipe will make a large batch of the batter, which you can store in the refrigerator for an even quicker drink, or use to serve a party. With either recipe, you will find that the Hot Buttered Rum is a cozy, creamy drink that is irresistible. Place the butter, sugar, and spices into the bottom of an Irish coffee glass or mug and mix well or muddle. Pour in the rum and top it with hot water. Make sure that your water is hot, but not boiling. If the water is too hot it can ruin the flavors of the drink. Think of it like making tea and heat your water as if you're brewing a cup of Earl Grey. Adjust the spices to suit your taste. Some people prefer more cinnamon or nutmeg while others don't enjoy allspice, so be sure to customize it. The beauty of the Hot Buttered Rum is that you can make the mix (or batter) and store it in the refrigerator. It's a more traditional way of doing this and is great for party service or if you simply want to have some batter around for the occasional cocktail. If making the batch of batter, store in a well-sealed jar in the refrigerator until needed. It will be ready for the first drink after about one hour. Many Hot Buttered Rum fans prefer to form their batter mix into a log. This makes it easy to slice off one piece at a time whenever you want a drink. To do this, place the batter onto a sheet of plastic wrap and use it to shape a long roll that's about 2 inches thick. Wrap it up tight, place it in an air-tight container (or plastic zipper bag) and store it in the refrigerator. When it's time to make a drink all you have to do is pour 1 1/2 ounces of rum, add a heaping spoonful of the batter, top it with hot water, and stir. Not a fan of rum? If you prefer whiskey, then you can make the simple switch and mix up a Hot Buttered Whiskey. Make a Batch of Batter: Mix together 3 cups brown sugar, 1/2 cup unsalted butter, 3 tablespoons honey, 1 tablespoon rum extract, 1 tablespoon vanilla extract, 1 teaspoon ground nutmeg, 1 teaspoon ground allspice, 1 teaspoon ground cinnamon using an electric mixer until everything is blended together. This batter mix recipe will make enough for about 25 servings and will keep for a few weeks, if not longer. If you're looking for a fun way to mix your Hot Buttered Rum, try using a red hot poker. The heat naturally melds all the flavors together, creating one luscious drink. It is great for camping and can be used for caramelizing dark beer. It takes some patience, so go slow and take care not to burn yourself. Also, the thicker the glass, the better. The heftier beer mugs with handles are perfect. Choose a clean, thick rod and let it sit in the fire until it is red hot. Shake off any ashes and slowly put it into the finished drink, being careful not to touch the glass with the rod or it will shatter. Leave it in for 10 or 15 seconds and enjoy your hot drink.